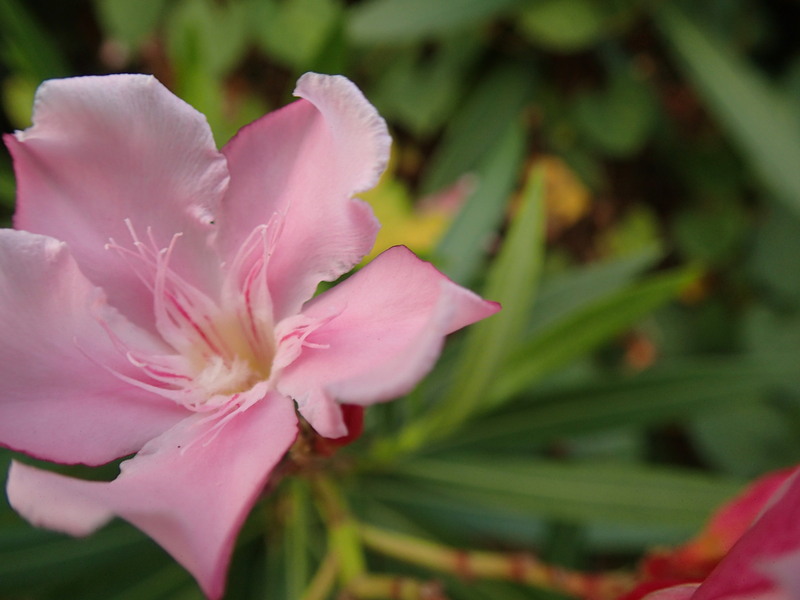 please follow me on blogspot! Please visit me there and let me know what you think! 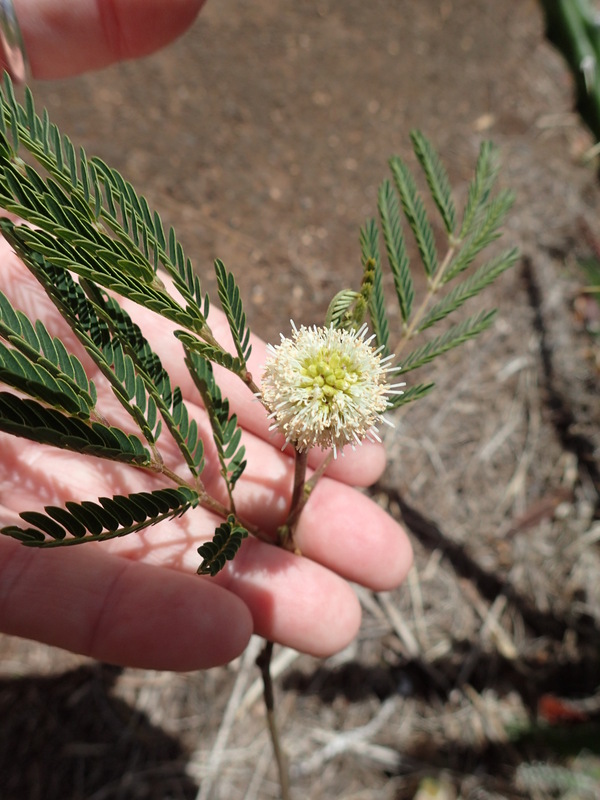 I am still learning the ins and outs of the new blog, so please bear with me. For example, not sure how to automatically get the posts in your email every time I write one. There MUST be a way to subscribe! 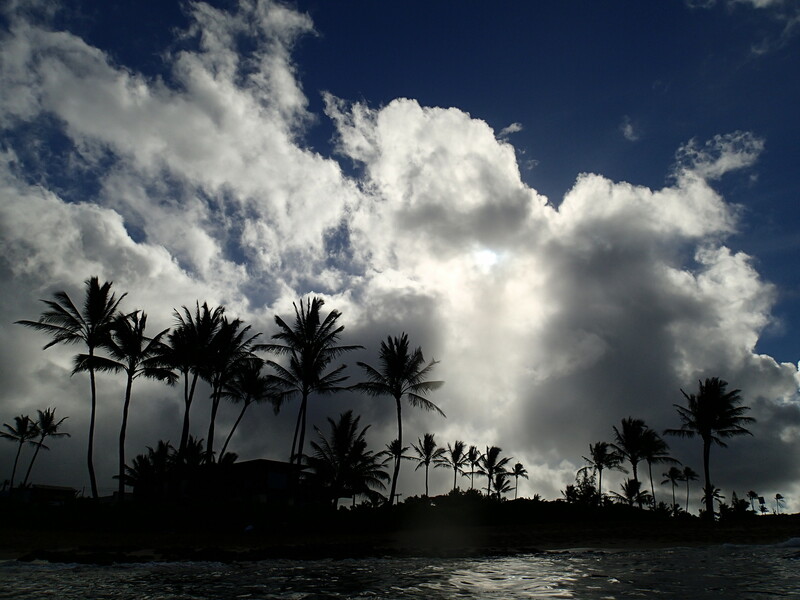 If you’ve been reading my posts, you’ll know I recently moved to Kauai. So I’m legally able to collect shells. Well, I have tried to pick up only those that are not in use and not likely to be. 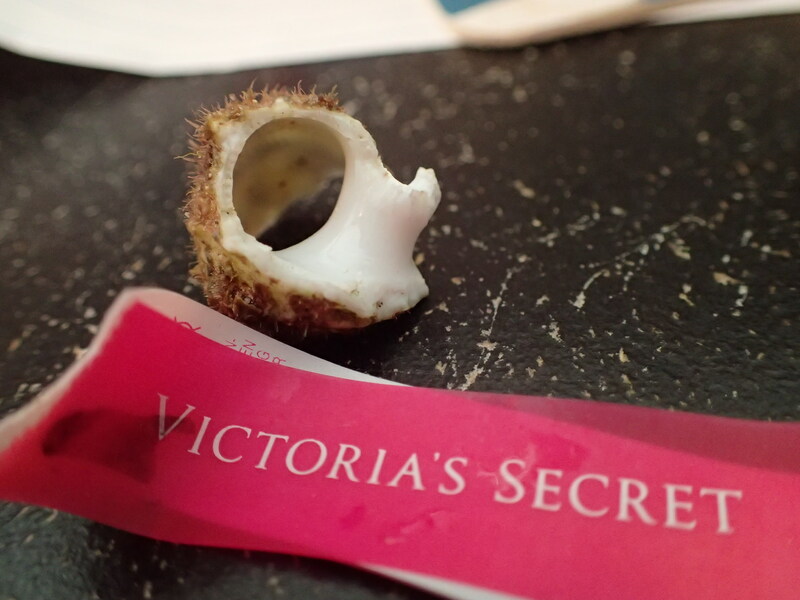 So I was surprised to discover when I brought home a shell yesterday, only to find a small crab in it! The little guy was not moving, so probably dead. Having been out of the water for several hours. Had I known it was there, of course, I would have not picked up the shell at all. It was quite a surprise, as both ends of the shell were broken, so there wasn’t any “good” protection for the crab. I’m surprised it didn’t run out of the shell when I picked it up. So perhaps it was already dead when I found it. I’m sorry to be involved in this story…. I will definitely be more careful to really look before I pick up any more shells..
A drupe, a turban and an i don’t know..
Nice swim today, with one octopus…and 2 Monk Seals! 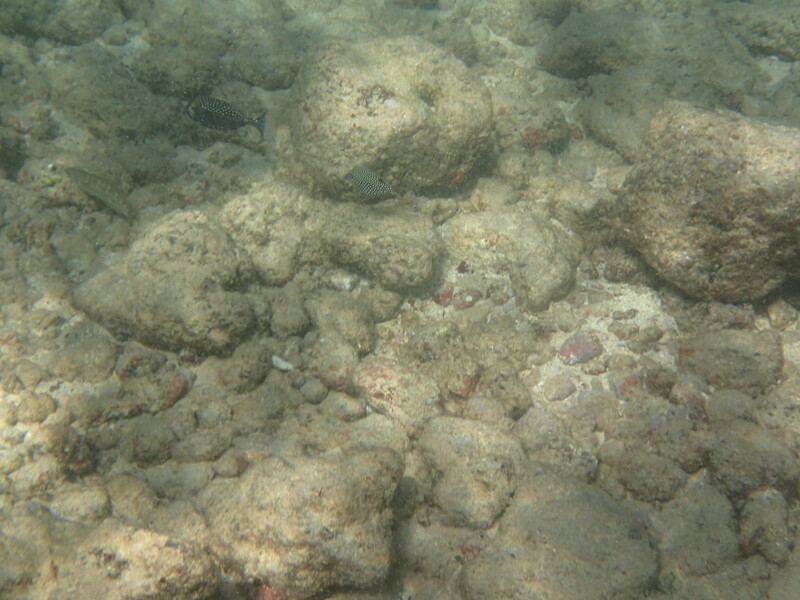 This one hardly moved at all, except to slide up a bit when I swam away. Shy apparently. And with 2 seals, you gotta expect a bit of excitement! Of course, I had to crop this, as some folks had to get into my photo. the nerve! 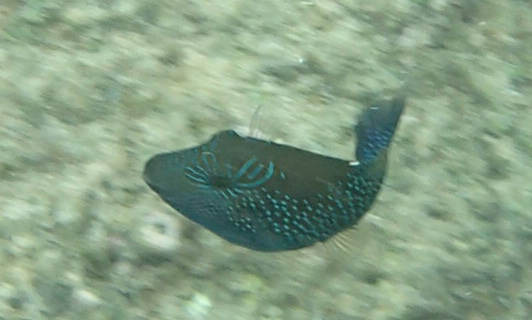 Canthigaster Amboinensis. 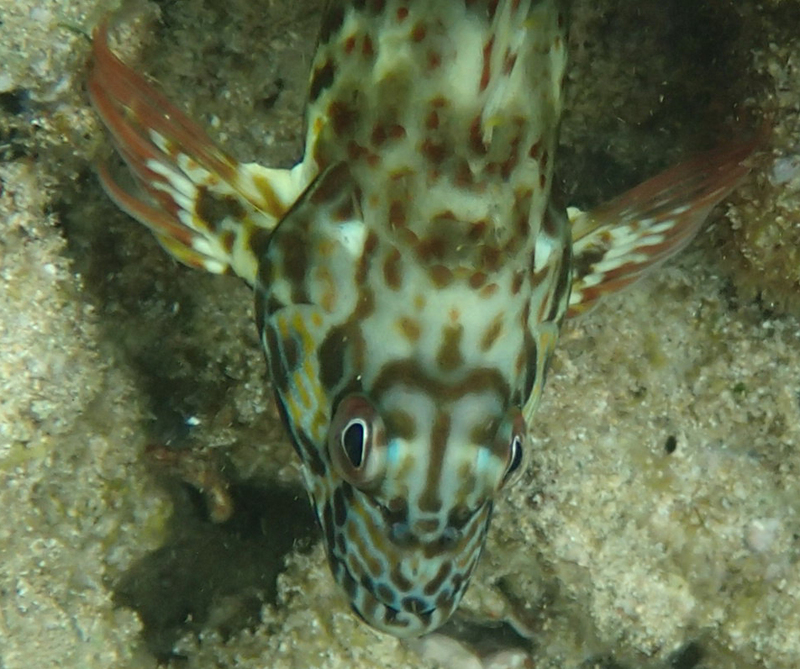 Ambon puffer. Oh too cute. 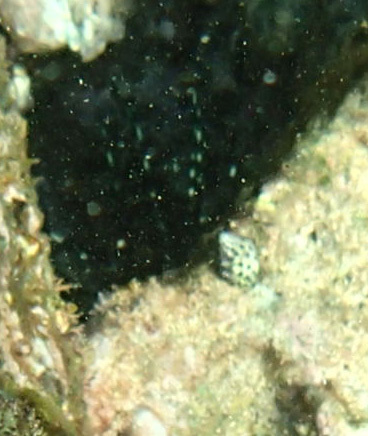 Turned out there was another puffer nearby, which I didn’t realize until later when I looked at the photo. Sometimes, it’s hard to see everything. 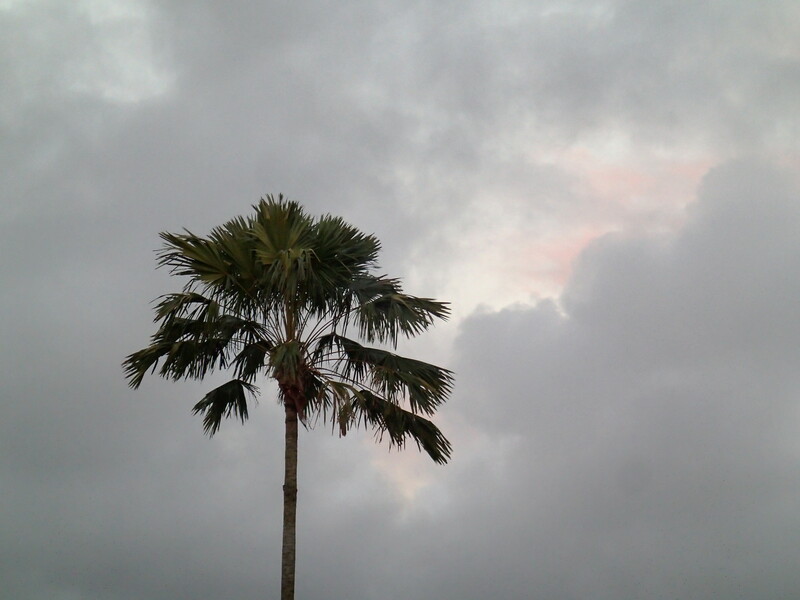 Palms and threatening sky…it did sprinkle at little bit. But I was already wet, so no worries. 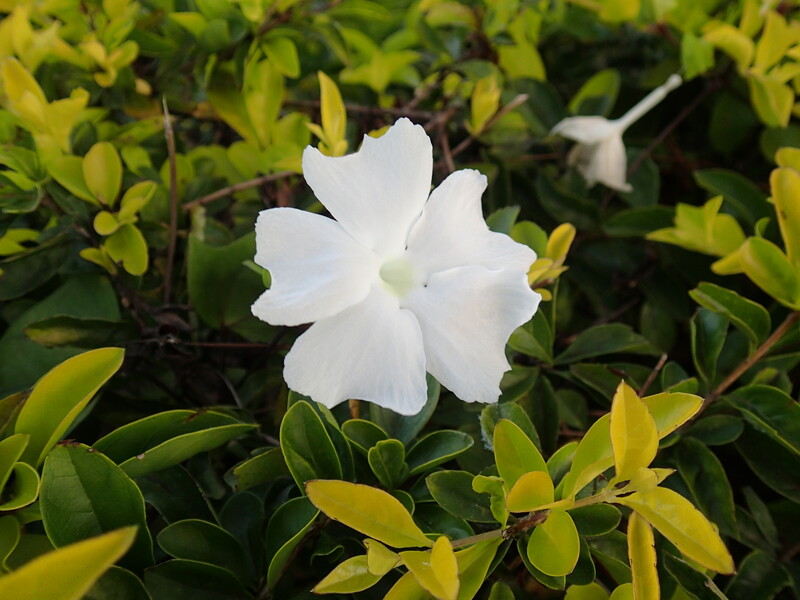 Another pretty flower…what is it about white flowers that makes them seem more delicate? 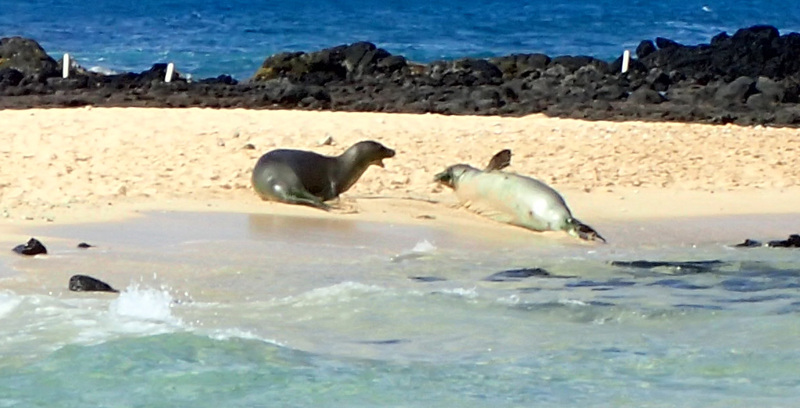 And today was a banner snorkel: one Monk seal and one small octopus! And the little one just lay there. And when I didn’t have my camera on and in my hand, it scoot-chied up the beach. Drat, another photo missed! You just never know what they are going to do. 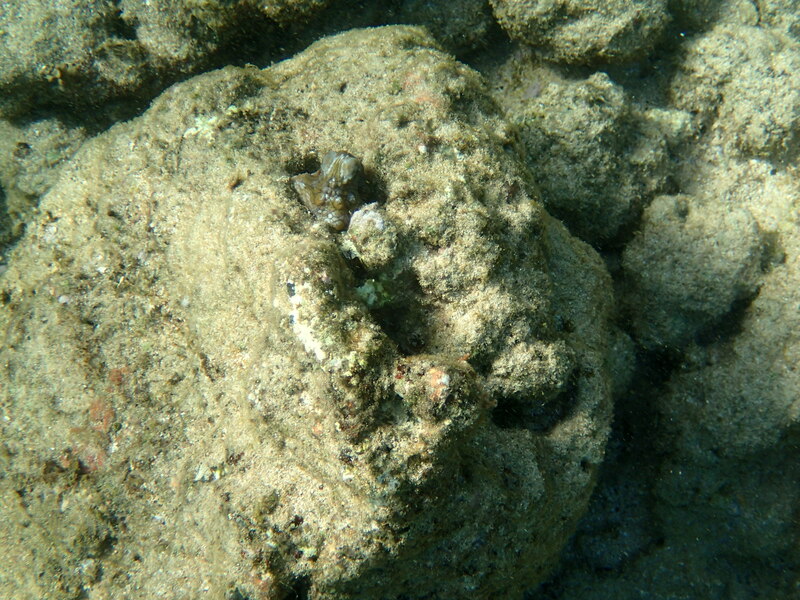 Young tako is just above the rock on the top of the coral lump…click on it if you need to. I was so happy to see this one. 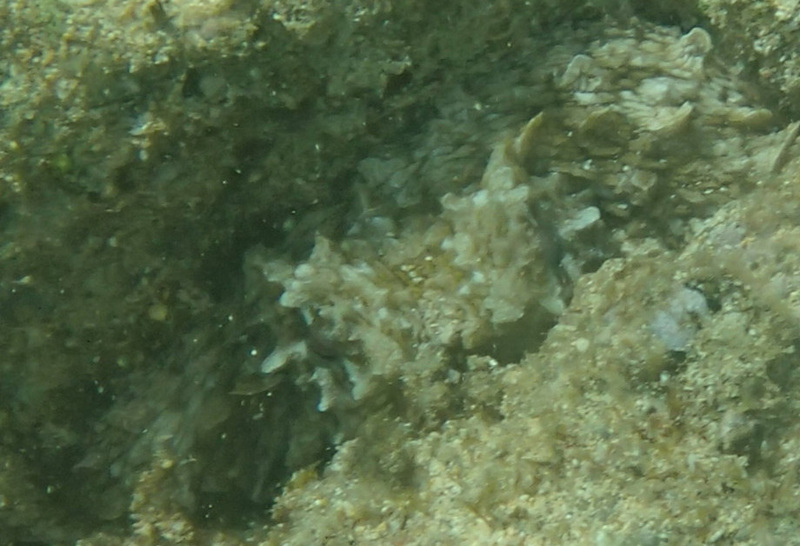 Not only because it was young, but also because the last time I swam in this area, I didn’t see my “regular” octopus (an adult), so I was wondering if there’d be another…And there was! Isn’t that just an amazing cloud, too?! I enjoyed the contrast of a close one with a further away one..
One blue one, one black. Eagle Eye challenge, you’re thinking? I agree. They are both there…. And an unusual octopus: a cross-eyed one! Thanks for reading. I may end up moving my blog to Google blogger, as my space is running out on this wordpress site. Would you follow me? I never like hearing there may be a storm…especially if we’re talking hurricane or tropical storm! But I am hoping that Dora will go away…I’m praying too. 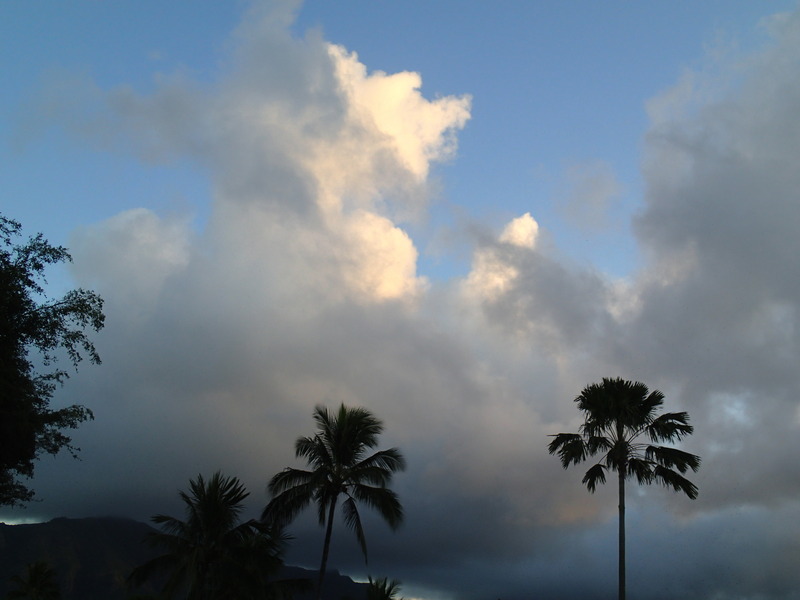 May I just say that Kauai is wonderful too? I feel as if they need to invent another word than just GREEN for the trees and grass here. It totally goes beyond just green. There’s a vibrancy to it that defies my words. Bet you thought it was all about the clouds, right? 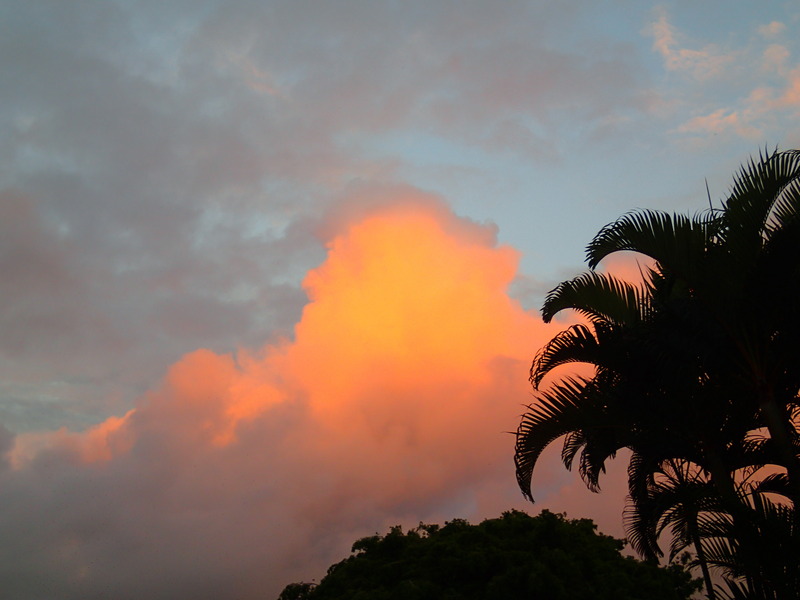 The hardest part of this blog is deciding which cloud pix to include. This is worth getting up early for. Oh yeah, you gotta love it when you pop up and see this! 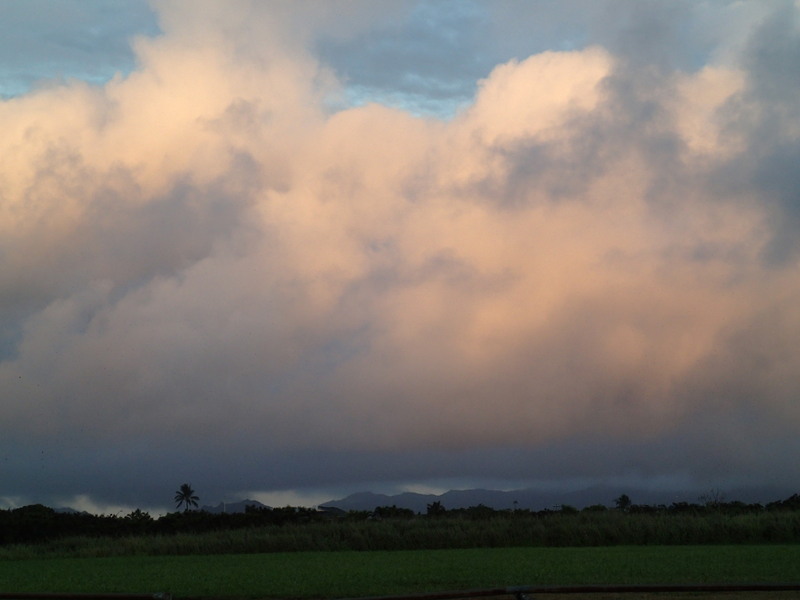 And just in case you think this part of Kauai doesn’t have abudefduf, look below. They come in groups here… and in this case, with a 4 spot butterfly. The bottom is really different here, so it’s constantly drawing my eye. And since it’s not illegal to pick up shells, I do sometimes. But only if they are broken, not alive or not in use! 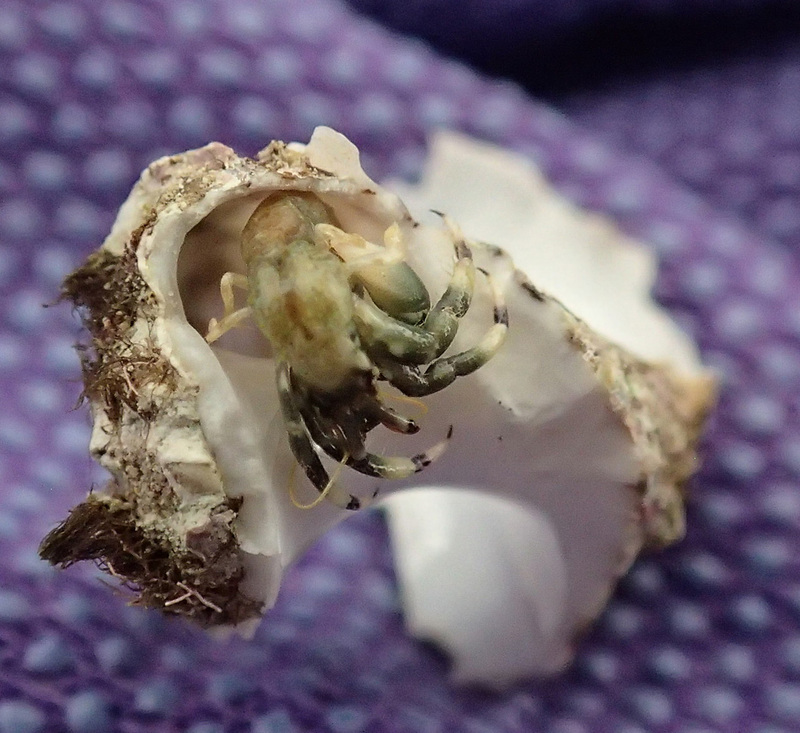 Hermit crabs can use old shells, so I only take the parts that cannot be reused. I still pick up broken glass almost every day. Not sure if that comes from boats, or trash bags..but I don’t want folks stepping on broken glass. Still alive, I think, so I left it. 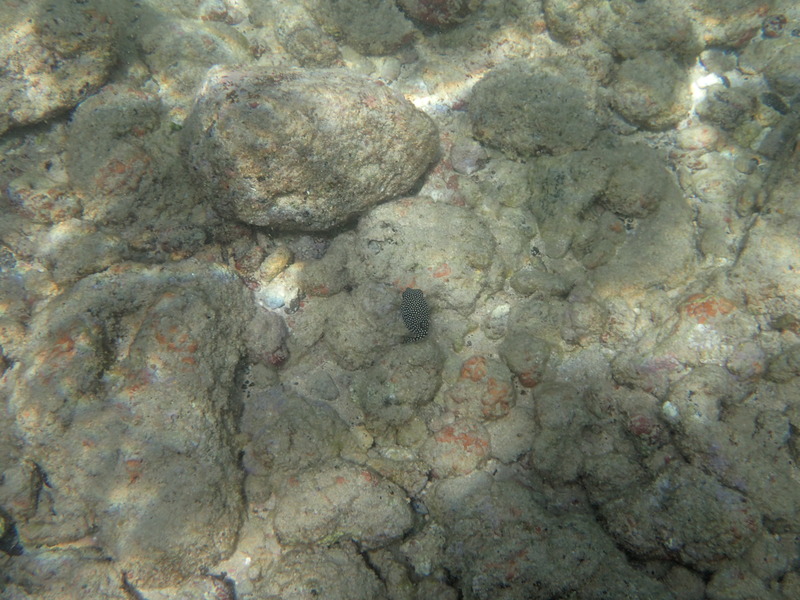 At the bottom, too, you can see a small tube…I think that might be the animal, or so it appears to me. Shells are amazing animals. Look at some picture books: the animals sometimes are caught on film with their bodies outside the shells. Just an incredible creation! It’s in the middle, hiding in the indentation on the rock. 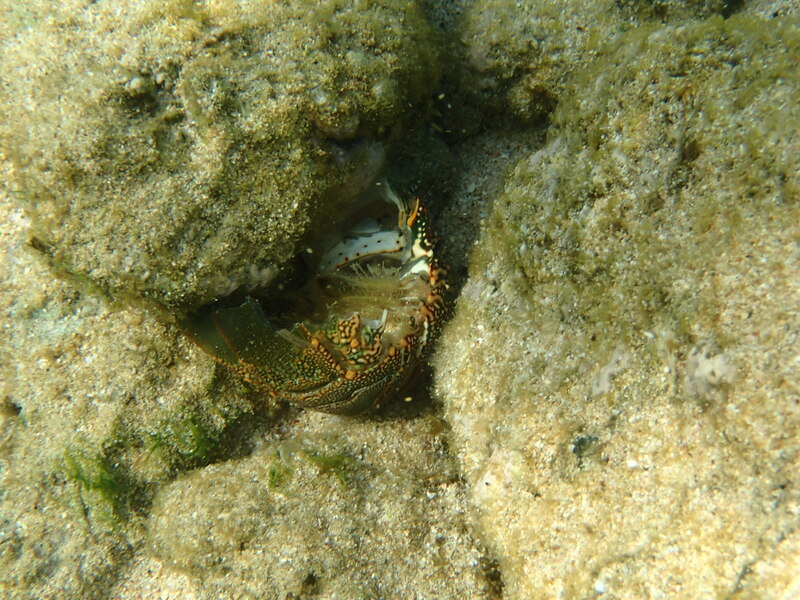 It is in great shape and from that I assumed someone was still occupying the shell, so i left it alone. 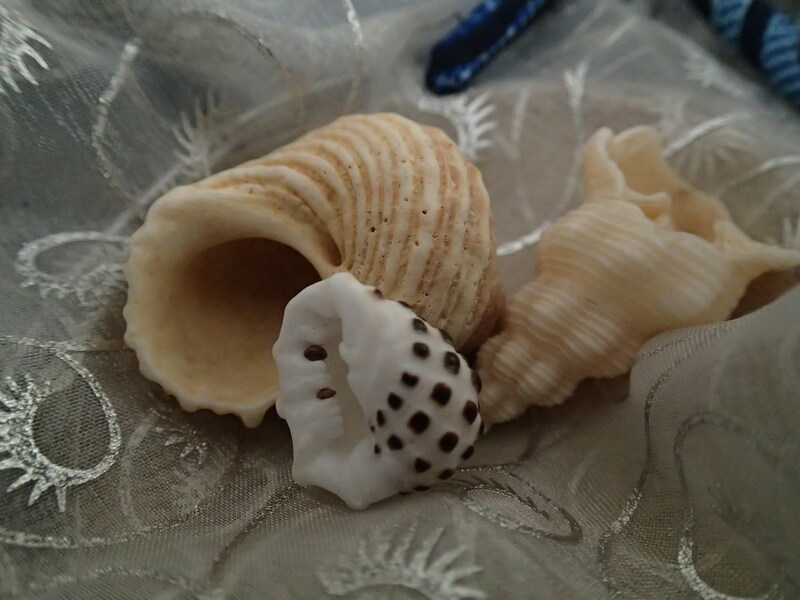 I do love the cowries….very beautiful and diverse shells. Can you stand another Eagle eye? Blue fin trevally and snowflake moray. Click on it if you need to. And before you think: How does she SEE those?! remember that the eel is usually moving, which draws the eye. Had it been stationary, it would have been harder to spot. And if you agree, please do search online for more cowries: the varieties are amazing. Would I lie to you?! And there’s a very cute green land lizard near our place. I’m going to concentrate on catching his photo sometime soon. 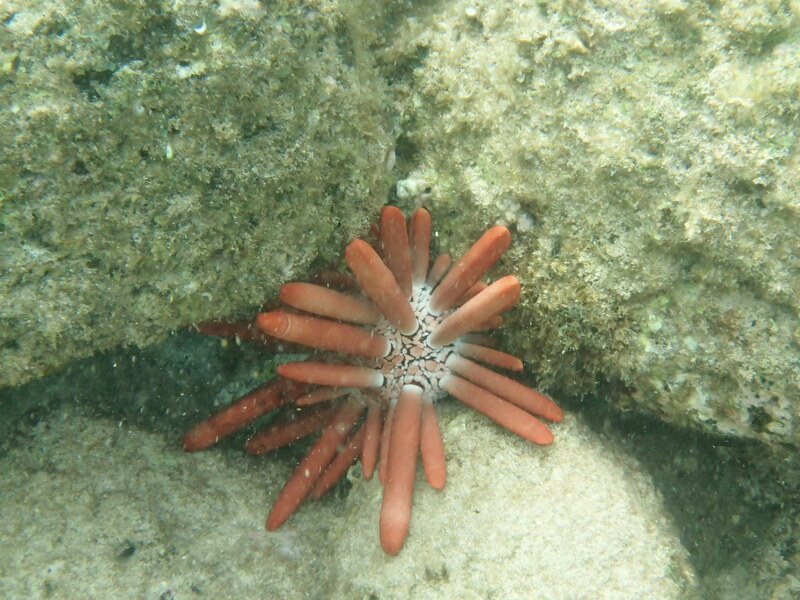 I think this is a cushion star. I’ll look it up. 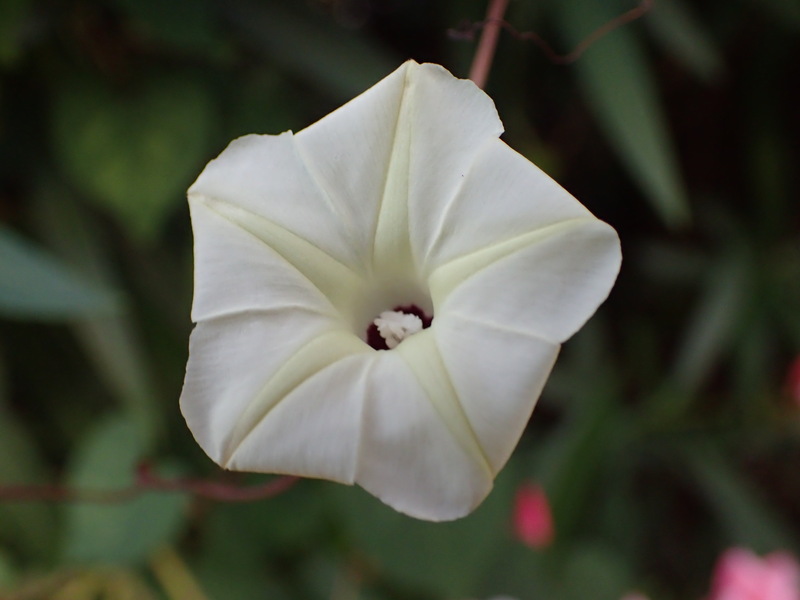 These, too, are not as visible on Oahu. Can’t think if I ever saw one! Please pray with me that the storm misses us. I’m not sure if there will be any snorkeling this weekend, due to proposed high surf. I love swimming, but not at the cost of life and limb. 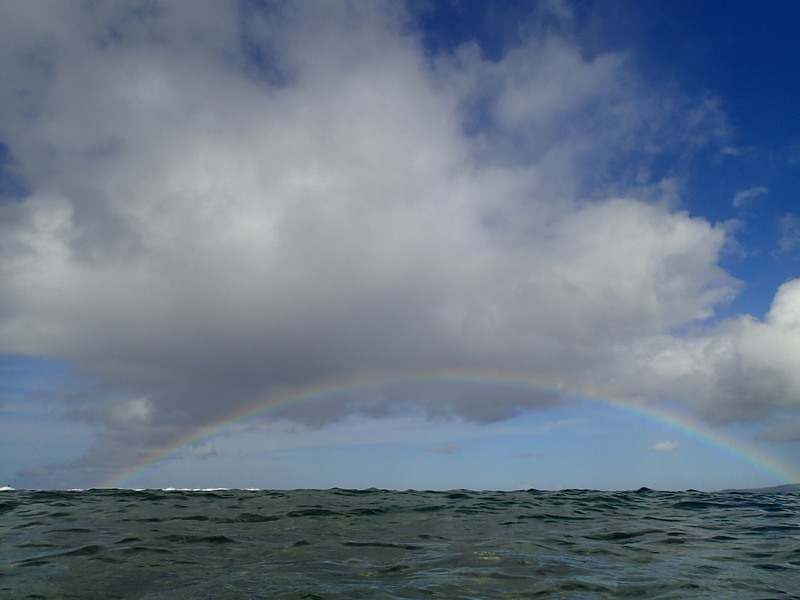 I am also praying for the families of those who lost their lives recently, in the ocean. It’s so sad that folks don’t realize how strong the wind and waves can be. Be careful when you’re near the wonderful ocean. 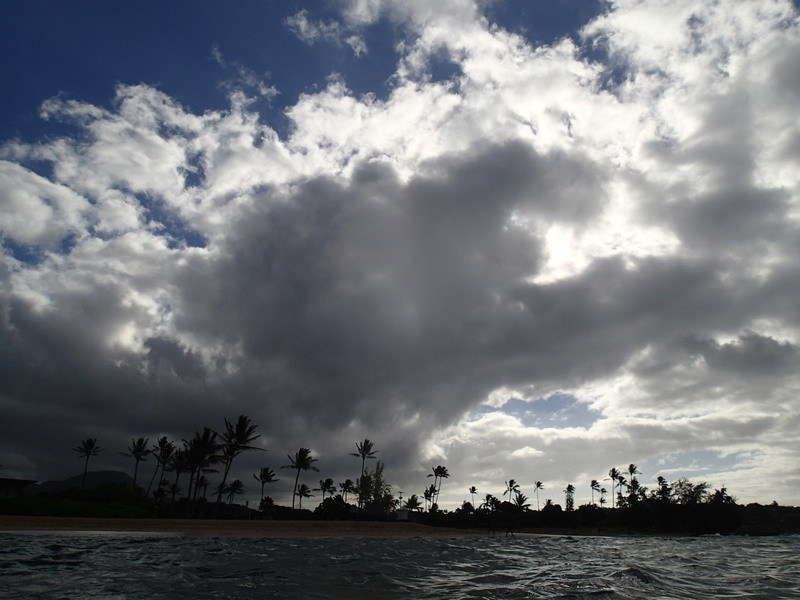 And in the good news category: spoke with a lifeguard at Poipu recently. He said they don’t have the jelly fish visitations that we experience on Oahu, so that’s great news for me! Since we are still moving things around, furniture-wise, in our new place, I haven’t put up much art. 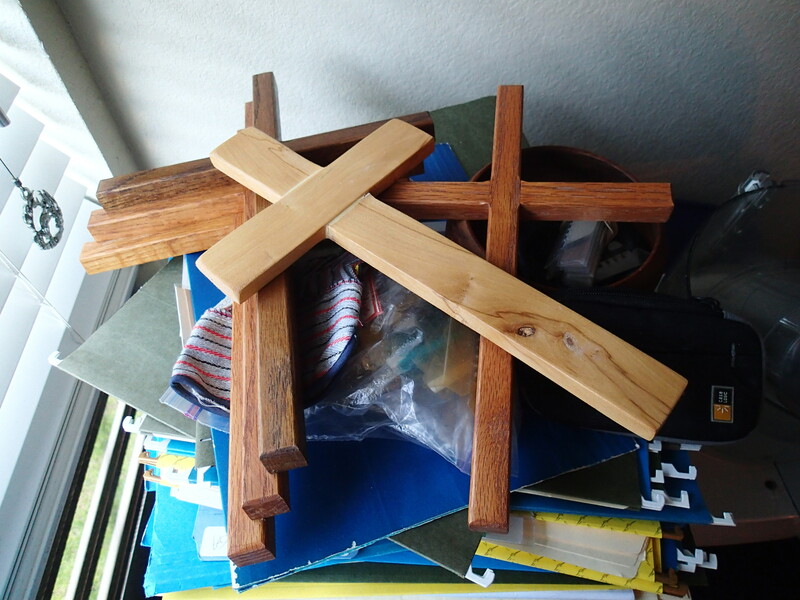 And I’m saving these crosses to put up where they will really be seen. Yes, there is a story attached to each one. In addition to the original story, that is. One came from an older gentleman, who made them to give away at a church in Texas. The one with 3 crosses I really like, because it reminds me that while Jesus might have felt forsaken on His cross, He wasn’t alone. (and tonight you will be with me in Paradise! How sweet were those words!) The third came also from my mother-in-law. I’m known in the family as the “one who would appreciate” crosses, and old Bibles. And oh, do I! I have the Bible from my uncle-in-law, who died I think before my husband was born. Some kind of car accident. But his Bible lives on! It is the cool kind, that have your name embossed on the cover. Anyway, I cherish these crosses, because they remind me what Jesus did for all of us. And in an odd segue, Jesus took care of me today again, in the water! I left the town where we live about 7:20 this morning. I had gotten on the computer and discovered that low tide would be in about a half hour, so I decided to change my plan to snorkel after church, to snorkeling before church. It’s odd how I felt rather unsettled about changing the plan. But I decided that Jesus would appreciate being worshiped from the water, as well as from the church. And did I! And the lifeguards don’t start work until 9 a.m. 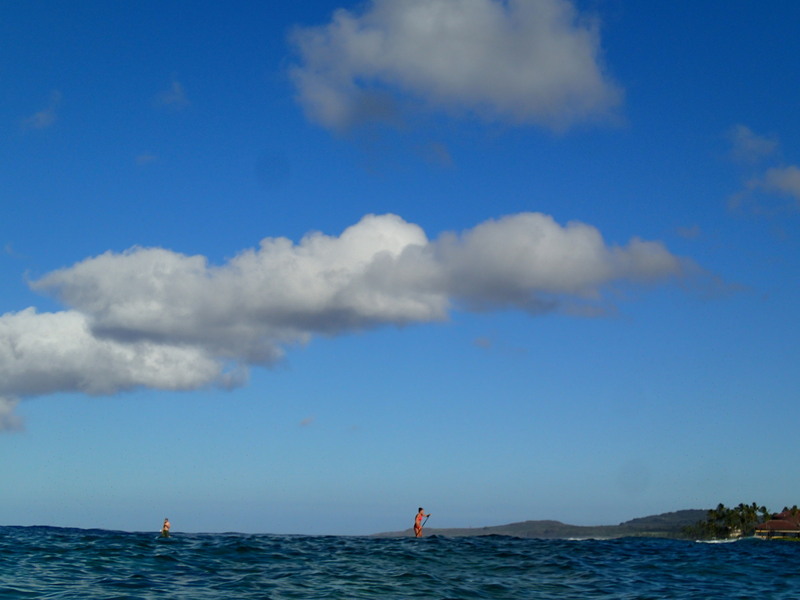 It was me and one other guy…who was standing in the water, without a snorkel. Gee, think of the things he missed! I am glad I popped up to see this rainbow! 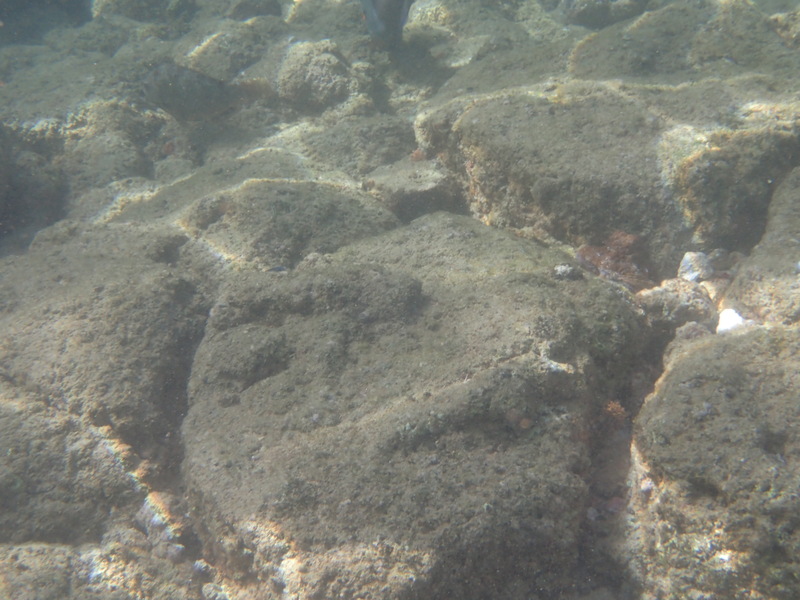 And I saw the octopus again. I’m assuming it’s the same one, because it’s in the same den. Not proof, mind you, but a strong suggestion. Yeah, unfortunately, it saw me…..but not before I snapped a few photos. This one is cropped…I wasn’t as close as it appears..
It’s the ball in the middle. I’m not sure that I want to be watching when it expels something…but it was a curiosity for me when I first saw it, a while ago. Sun from behind the clouds.. 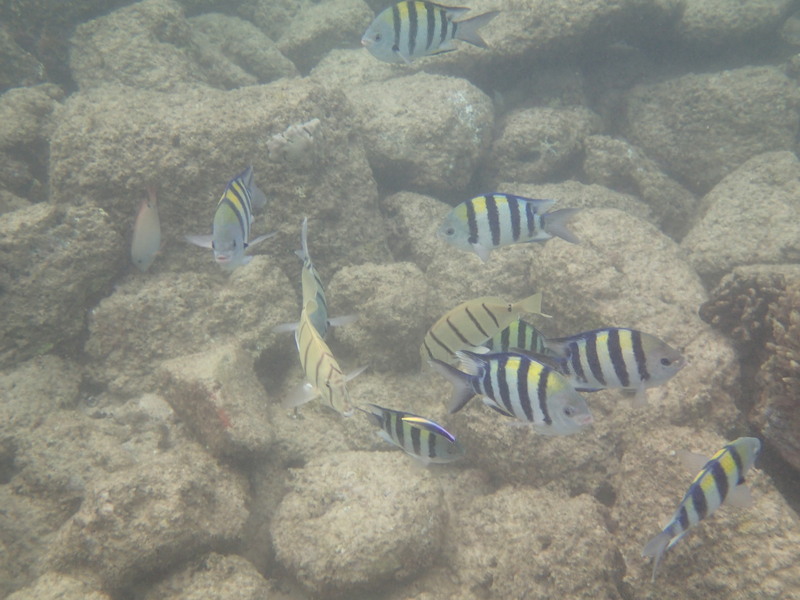 These are different damsels than I’m used to on Oahu. 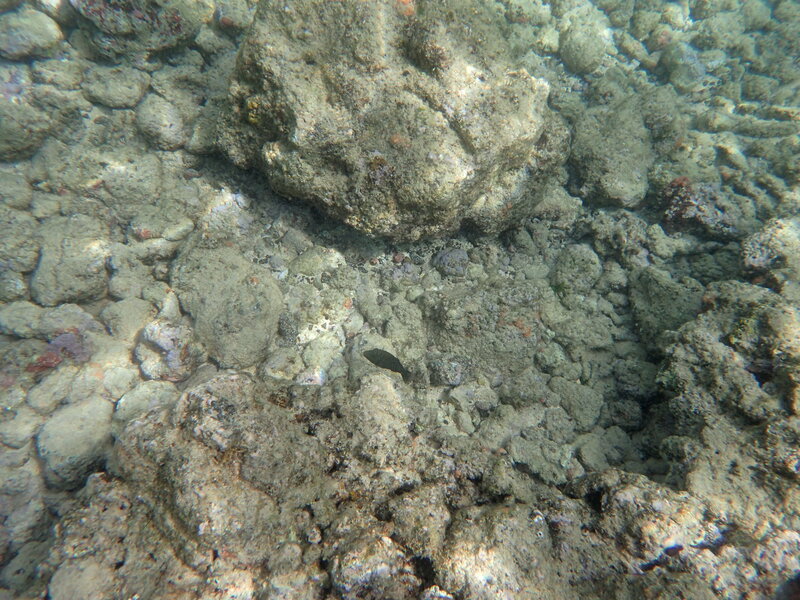 You can see the cleaner wrasse on the fish in the middle bottom of the picture. It reminds me, too, that there are so many different stripe designs! God was having fun that day. The damsels stripes go from top to bottom; the cleaner from front to back. And the cleaner has very cool purple coloring, too. 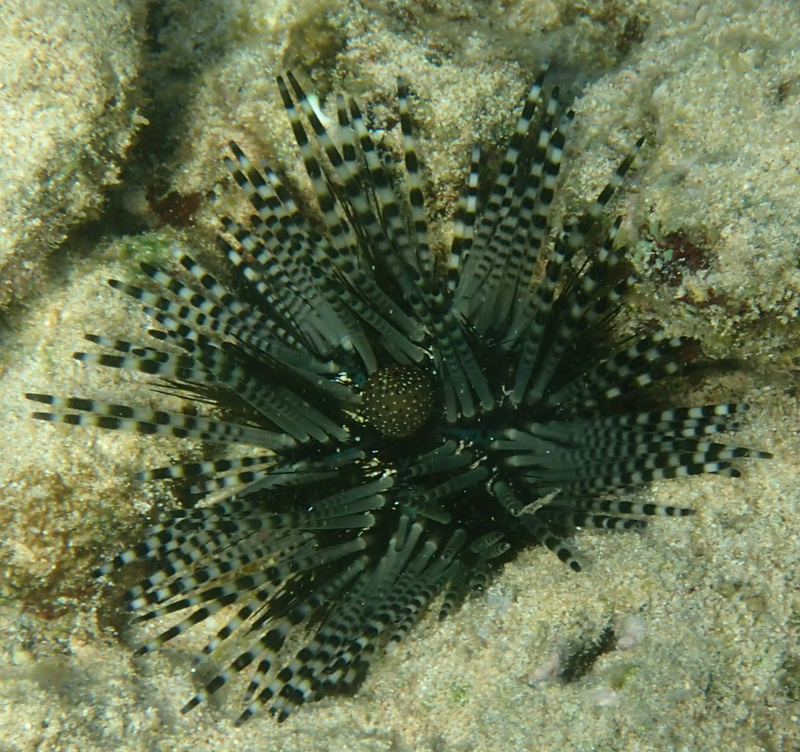 I didn’t realize when I took this picture, but there are actually two urchins there. You can see one behind the other. I took the photo because I picked up a broken off “pencil” the other day. Now that there’s no stricture about taking shells, etc., I picked it up. 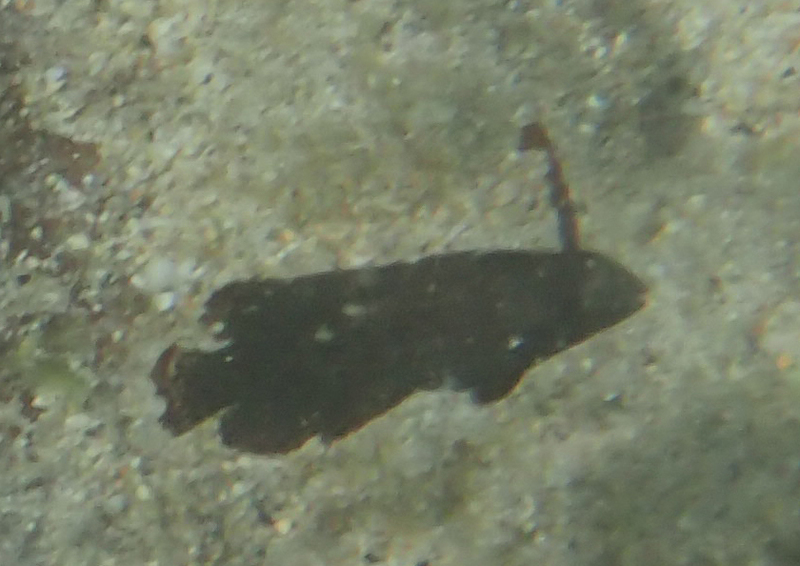 It was brown, apparently having been in the water since breaking off. I don’t plan to make a habit of picking up shells, however. Certainly not those that might be re-used or still being used by the original animal. That’s a no-no in my book! That’s the tail toward the camera. And let’s just say it wasn’t me eating lobster! If you haven’t seen Tropic Birds in the real, go to the internet to see them. Amazing birds!!! Swooping all over the sky. 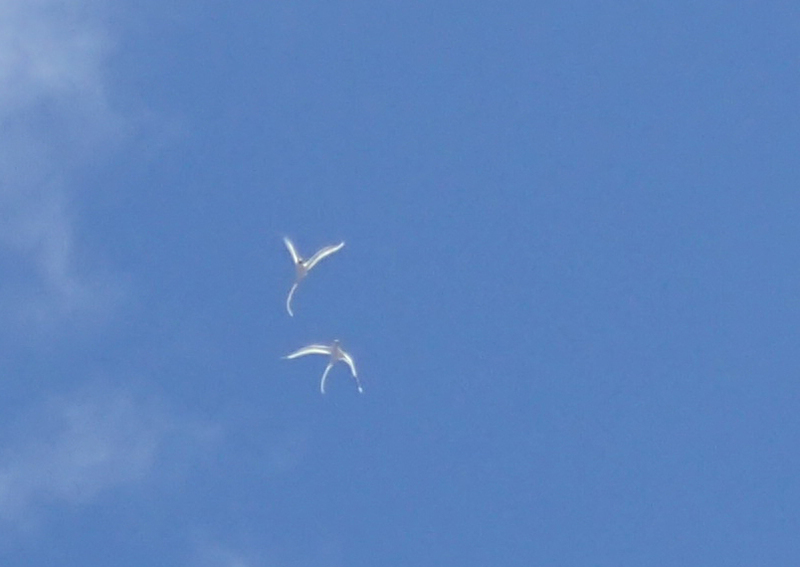 Kinda reminds me of Fairy Terns. But with longer tails. 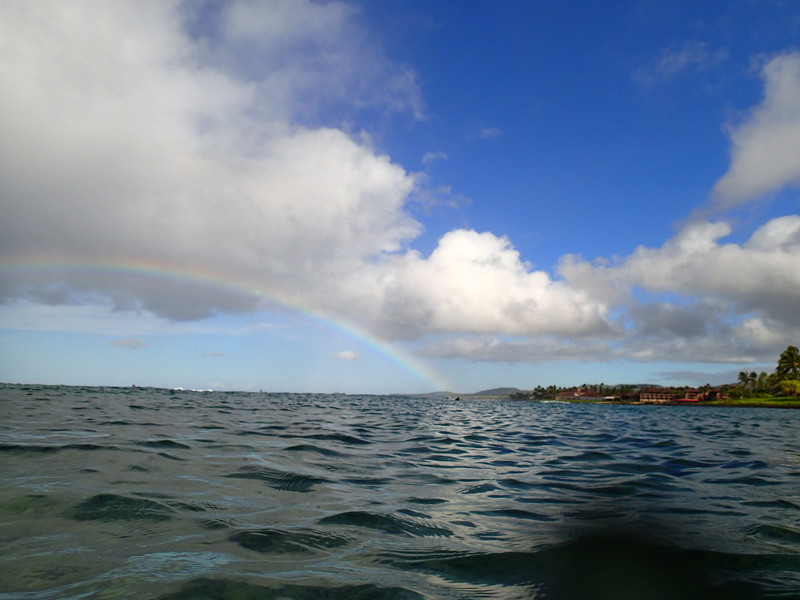 And to close, I’ll put up the photo that makes me smile, still….the surfer with the rainbow on his head! I wonder if he could see it?! But doesn’t it look like it’s right on his head? Morning fog from our lanai. Alex, here’s your palm tree! and here’s your other one. 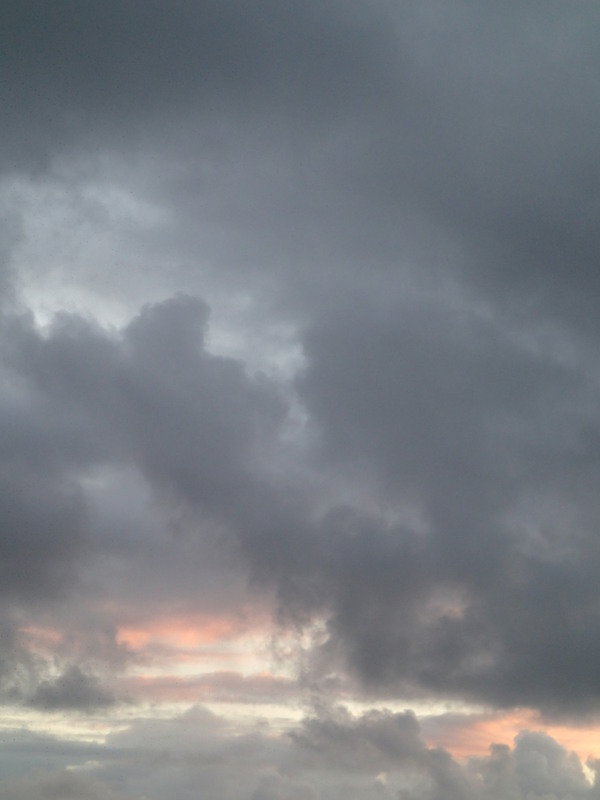 Just to get a sense of the immensity of this cloud bank. Just started a Bible study on Victory in Spiritual Warfare by Tony Evans. Satan got no hold on me! Have a great day. I used to hate using that expression, but what else can you say? Have the kind of day you truly want?! 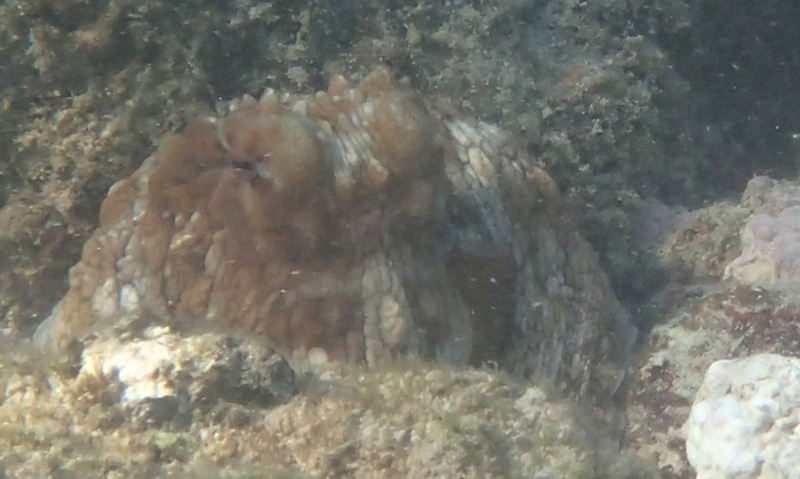 First octopus of this time on Kauai! Hurray! 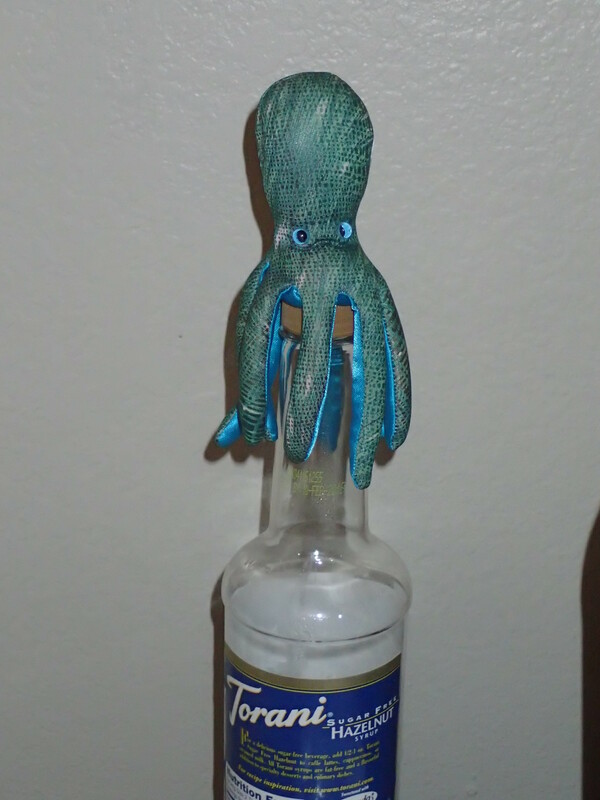 Today I finally ended my spate of un-octopused-swims. And yay for that. Thanks, God! I was actually thanking God and smiling into my mask when I saw this octopus today. Of course, since it had been so long between views, I did take several pix. 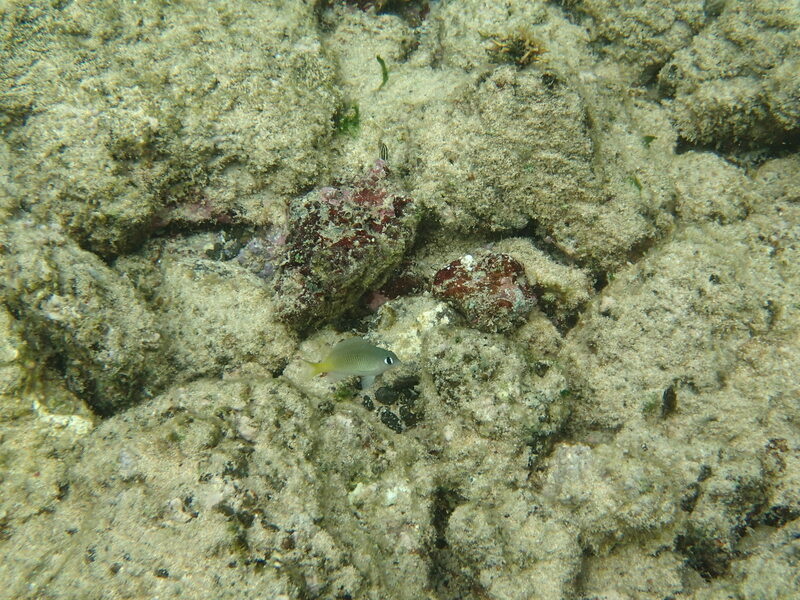 And then as if the octopus was not enough, I also saw a fish I didn’t recognize! Again, not the best photo, but you can see the antenna on its head. I will have to consult the books and internet to get wisdom on this one. Unless any of the Oahu contingent recognize it?! It was probably 1.5 inches long and very quick, flipping this way and that. Or as Alex would say: Crab-ness! Very cute, but in shadow, I’m afraid…. Oh man, it’s really small isn’t it? Click on the picture to see the cool blue patterns. Lunch at Tortilla Republic in Kukuiula Shopping Center. Yum! Had it been me being the chef, I would actually have left the kale raw, but it was good this way too. Hiding under chicken. Anyway, my friend said her cat is fat! I was kinda surprised/horrified, as I think fat cats are just out of shape and lazy. (I DID warn you I’m not a fan, right?!) I asked how fat? She thought for a minute and said her cat is “not as heavy as a bag of rice!” We all laughed. It was such a Hawaii kind of thing to use as a comparison. And that’s why lunch was so much fun….laughing with friends. 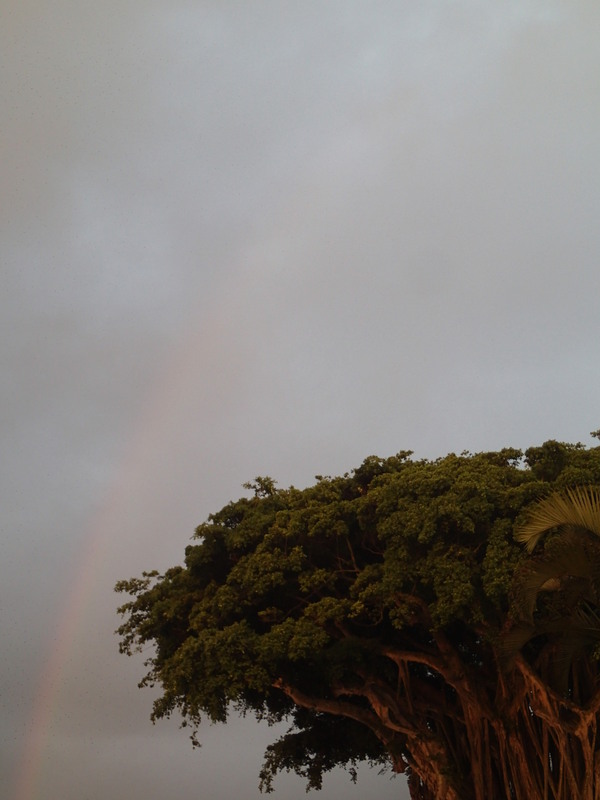 And just so you know that Hawaii is mega-cool, if you don’t already, there were many wonderful pictures I couldn’t catch on the way to Poipu beach this morning, like a wonderful rainbow and fluffy clouds, a bit of real rain looking like fog over a mountain top and nice trees. 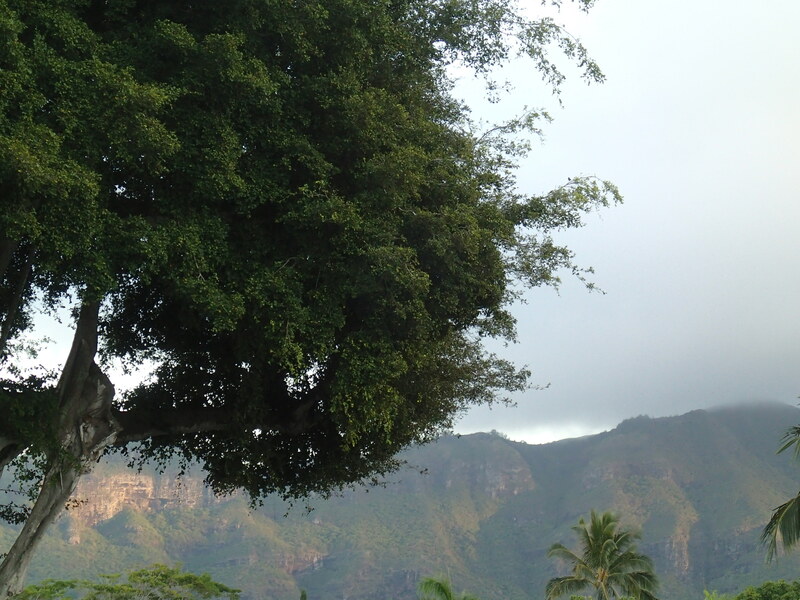 Kauai invented green, I think. Isn’t it just the coolest?! With the flower inside a flower thing going on. 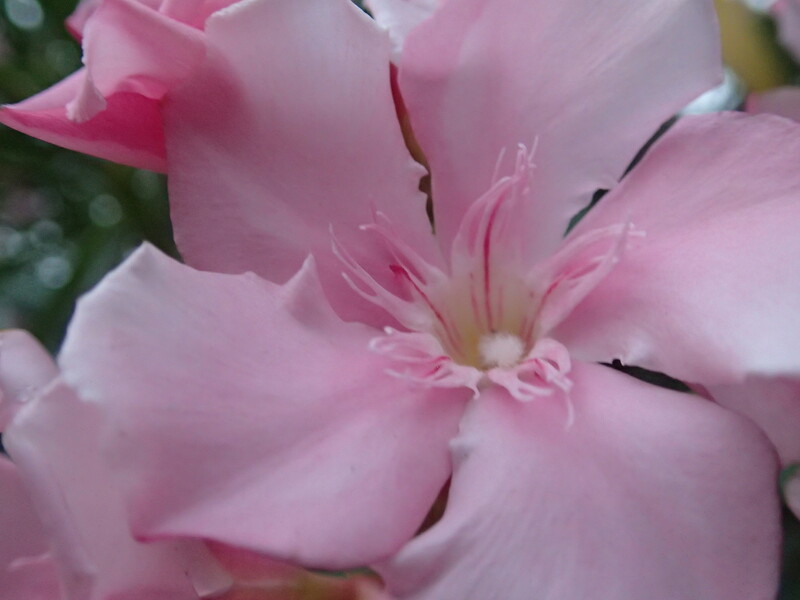 And pink, too.